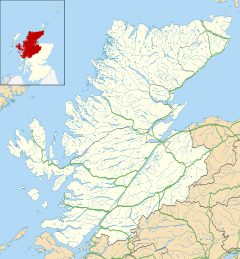 Torridon (Scottish Gaelic: Toirbheartan) is a small village in the Northwest Highlands of Scotland. However the name is also applied to the area surrounding the village, particularly the Torridon Hills, mountains to the north of Glen Torridon. It lies on the shore of Loch Torridon. Torridon is on the west coast of Scotland, 109 miles (175 km) north of Fort William and 80 miles (130 km) west of Inverness. Situated in an area well known to climbers, photographers, wildlife enthusiasts, hikers, and countless visitors from around the world, the surrounding mountains rise steeply to 3,500 feet (1,100 m) from the deep sea lochs. There is a large hotel, The Torridon, which holds 3 AA Rosettes as well as 4 red stars and is Scottish Hotel of The Year 2011, a popular public bar (The Torridon Inn), and a youth hostel within walking distance. The Torridon area is widely acknowledged as having some of the most dramatic mountain scenery in the whole of the British Isles. From 1925 until 1931 John McQueen Johnston served as GP to the area. Torridon hosts the annual CELTMAN! Extreme Scottish Triathlon since June 2011. The 3.4 km swim takes place in Loch Shieldaig while the 202 km bike leg is notable for the strong winds affecting competitors. Finally the 42 km run takes in two Munros during the race over the Beinn Eighe range. Liathach seen from Beinn Eighe. The triple buttresses of Coire Mhic Fearchair behind Beinn Eighe. ^ "CELTMAN! Extreme Scottish Triathlon". cxtri.com. Retrieved 27 April 2018. Wikimedia Commons has media related to Torridon. Wikivoyage has a travel guide for Torridon. Torridon.org is the local website, listing accommodation and useful information. Torridon walks gives comprehensive information on walks and places to stay in the area, including Gaelic pronunciations and OS maps. This page was last edited on 4 December 2018, at 10:27 (UTC).